Several years ago, I stumbled across a book called Wildwood. Most of the reviews for it were written by fans of the band The Decemberists, because the author, Colin Meloy, happens to be their lead singer and songwriter. (Incidentally, I don't know much about The Decemberists. I've tried to get into their music several times, since I like the basic style of it and the album covers and most of the lyrics...but I'm just not a huge fan of Meloy's voice most of the time. I do really like some of their songs, though.) I was drawn to the book for different reasons: mostly the gorgeous cover and how it was sometimes referred to as an "American Narnia." I read the first book in 2012, and I was a little disappointed with it. I found the writing style so awkward and annoying, and I had to drag myself through the first half of it (though it picked up after that). Then nearly a year later, I read the second book. I had forgotten some details, and the beginning of the book felt so slow that I almost just put it aside. But I kept reading and ended up loving it and thinking it was so much better than the first book. The third and final book came out last year, and I bought it then but held off on reading it because I wanted to reread the other two books first. This children's fantasy series is set in present day Portland, Oregon, though in a slightly alternative-universe way. A lot of the locations in the books are inspired by real-life places in that area, and apparently there are lots of stereotypical "Portland hipster" references in the books. I wouldn't know, honestly, because I've never been there. :) But I will say that Prue, the main character, is a 12 year old who is a vegetarian, rides her bicycle all over town, drinks coffee, and browses through vinyl records. Anyway, in the series, outside of Portland is an area known as the "Impassable Wilderness." The Portlandians don't realize that there's an entire society living inside the wood, because the two worlds are separated by a magical boundary. The first book starts off with Prue's baby brother being kidnapped by a murder of crows (yes, that's the actual name for a group of crows). Prue follows them into the Impassable Wilderness to rescue her brother, along with a schoolmate named Curtis. They're surprised to find themselves in a world of coyote soldiers, owl princes, bandit kings, and an exiled ruler who is planning on using Prue's brother as a sacrifice to take over the whole wood. With the way the first book ends, the story seems neatly wrapped up. But as the second book, Under Wildwood, begins, we realize that things aren't going as smoothly as they seemed. There are new threats, so Prue is called back into Wildwood for her own protection. Oddly enough, I think that after rereading the second book, I liked it a bit less. It was still enjoyable, but it does suffer from second-book-syndrome. New characters and issues are introduced, and things are happening, but the plot doesn't move forward in a huge way. You get the feeling that the author is mostly just setting up for the third book. There are three intertwining stories being told in this book, and that's done really well. So now we're into the final book, Wildwood Imperium. There is a lot going on in this book. I don't mean that it's action-packed, because it's not (not until the end, anyway). The main characters are separated a lot and there are new characters being introduced, so the author is juggling too many perspectives and it gets overwhelming at times. It worked well with three perspectives in Under Wildwood, but here it feels a little out of control. I love Esben. We met him briefly in the second book, but he's more present in this one, and he's one of my favorite characters of the series. His friendship with Prue is so endearing. As for another new character, I didn't like Zita at all. I know she changes by the end, but she makes stupid decisions and causes a lot of bad things to happen. I have to mention the illustrations in this series because they are so gorgeous and I can't imagine the books without them. The illustrator is Carson Ellis, who is married to the author. Her illustration style is incredible and it suits the books perfectly. 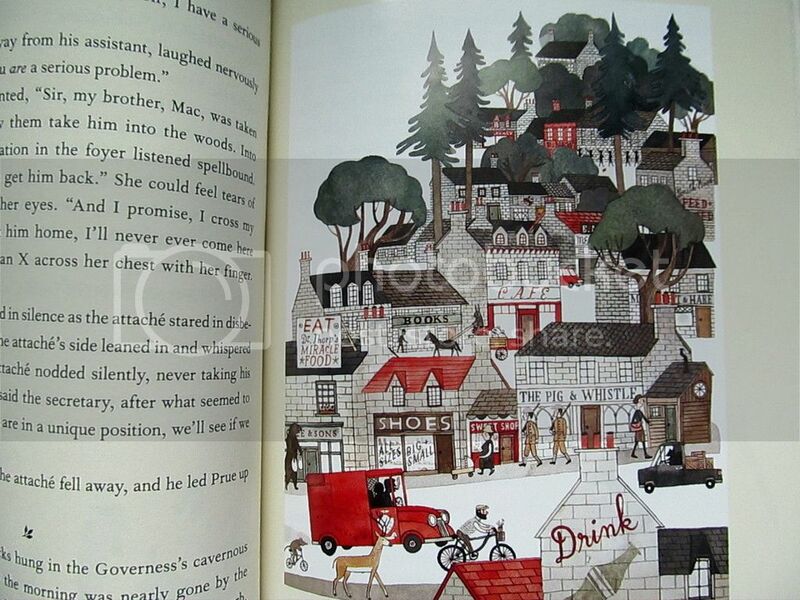 I can't explain why, but her style is so appealing to me (it's similar to Jon Klassen, another of my favorites). These books are some of the most beautiful ones I own. 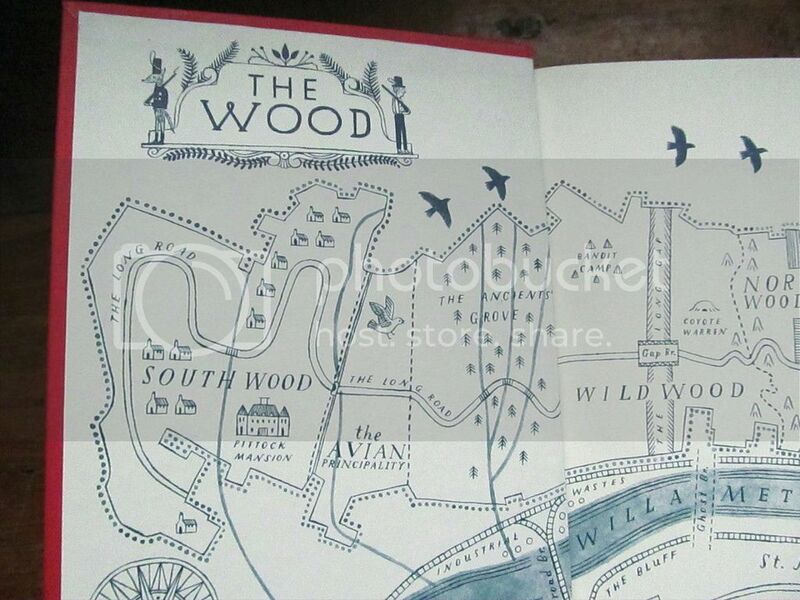 The covers are lovely, the end papers are maps of the wood, and Ellis' illustrations are scattered throughout the pages. 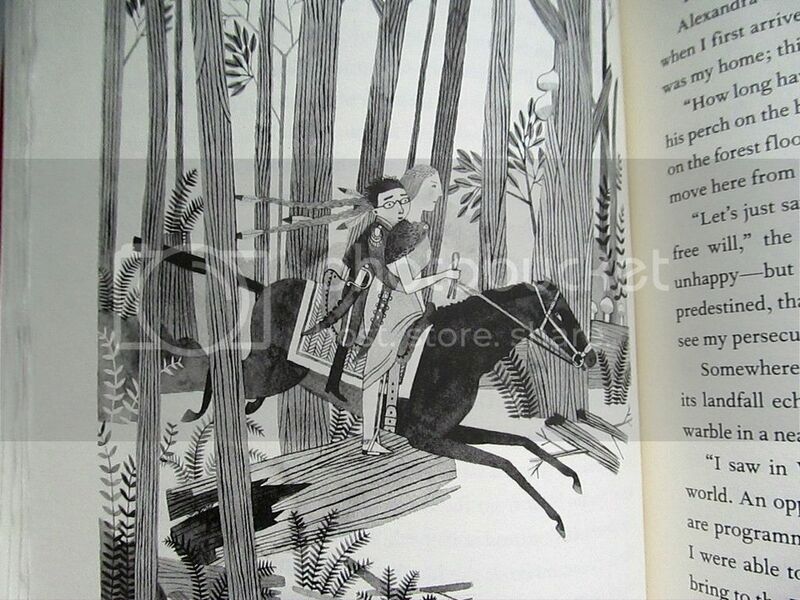 There are lots of black and white illustrations, but there are also a handful of full-color plates in each book. It was always a nice surprise to unexpectedly come upon an illustration while reading. 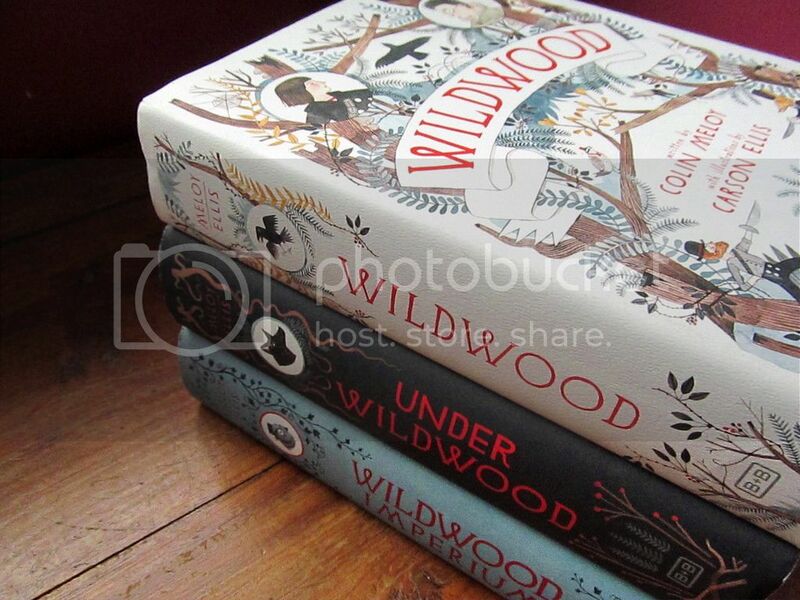 I would recommend checking out the Wildwood trilogy if a quirky, folksy children's fantasy sounds interesting to you. It does have flaws and the story drags at times. But the atmosphere is so charming and there are lots of memorable characters and aspects. I feel like this is a series that I'll enjoy more each time I reread it. I enjoyed your review so much! I actually found you through Yarn Along, but this series sounds reminiscent of "The Girl Who Fell Beneath Fairyland" etc., which I adore, so I'm feeling a sense of urgency to try these as well! I was wondering if I could publish this as a guest post on my fairy tale blog www.spinstrawintogold.blogspot.com? You could even write an entirely new one if you wish (but I don't want to trouble you!). Thank you tons! I will let you know when I put it up (with a link back here of course!). I will definitely have to give these a read as I'm a big lover of childrens' books too. And the illustrations - gorgeous! Worth buying the books for those alone. Yes, the illustrations are some of my favorites! Carson Ellis' style is just really appealing to me. And the books are good, too. Hope you enjoy them!